Economy. 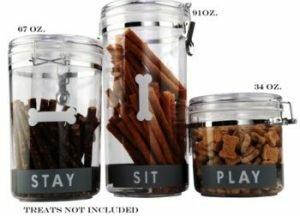 Petmate treat jars are economical enough to have one or more in several rooms of the house, so you’re never far from a dog reward. Economy. Dog treat jars can save money by keeping treats fresh. A treat is not much of a treat if it’s dry, stale and crusty. Petmate treat jars have tight seals that keep out air circulation. You won’t be throwing away dried-out treats. Safety. Too much of a good thing is too much. Original packaging that dog treats come in may be flimsy plastic or foil, making it too easy for a dog to tear into it and eat the entire contents, leading to gastrointestinal upset and possibly pancreatitis. The tight-fitting lid on the Petmate treat jar can prevent that misfortune. Convenience. Treat jars come in a variety of sizes. 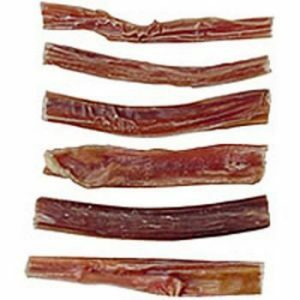 You can have Treat Umms Dog Treats in a small jar, Smokehouse Pizzle Stick Dog Treat in a tall jar, and Newman’s Own Organics training dog treats in a medium-sized jar. Safety. Petmate treat jars are made of high-impact plastic, not glass, to ensure no cut feet in case the jar falls (or gets knocked) from a counter. Click here to find out more about the Petmate dog treat jars. They do everything except refill themselves!